HOW DOES YOUR AGENCY HANDLE COMPLAINTS? It’s impossible to please everyone all the time, and your home health care or hospice agency is no different from any other business with regard to complaints. In the home health care field, however, the scrutiny accompanying complaints is intense and multi-faceted, involving a lengthy list of both state and federal oversight. Your agency may be reported to your state licensing and certification division, entities responsible for accreditation, the U.S. Office of the Inspector General, the Office of Civil Rights — and the list goes on. Since 2006, the U.S. Justice Department has taken a particular interest in hospice agencies, suing more than a dozen for fraud and scrutinizing many more. Stringent accountability really is the only safeguard your agency has under such intense scrutiny. Proactive measures will help ensure that your agency handles complaints and grievances in a way that meets not only the Conditions of Participation imposed by the Centers for Medicare and Medicaid Services, but any unannounced, on-site investigations by authorized entities of review. Agency accountability begins with a set of well-defined policies and procedures regarding complaints and grievances, according to Home Health Solutions owner and author J’non Griffin. “The agency must be able to demonstrate that it takes complaints seriously, documenting each in a standard format, responding in a respectful and timely manner, and thoroughly investigating the complaint within a reasonable amount of time,” J’non says. While it is important to note that different states may have varying requirements and time limitations for how complaints are reported, some general guidelines apply to all. Policies should be in writing, clearly spelled out, and the agency should not depart in any way from the procedures it has set forth, J’non says. In her new e-book, “Survey Ahead: Navigating the Guidelines,” J’non explains that one of the crucial points to be evaluated during Survey is how well an agency complies with its own stated procedures for grievance and complaint resolution. All employees — including new hires — should be familiar with the agency’s complaint process, knowing exactly how and to whom complaints should be reported at the agency. Identifying this person, and the process to be followed, should be a prominent part of the agency’s written policy. Reviewing the procedures at least annually with staff members will help ensure compliance. Staff education efforts must also ensure that employees recognize and respect a patient’s cultural, psycho-social , spiritual and personal values, as well as understand the need to show respect for the patient’s property. Language barriers and cultural differences account for many of the complaints lodged against home health agencies, and can often be resolved or prevented with proper education and training. While showing respect for a patient’s expectations of timely visits is not a specific right under the law, it is worth noting that failure to adhere to scheduled visits in a punctual manner also ranks among the most common and easily preventable complaints lodged against home health and hospice agencies. – Lack of notification from the office if a visit must be rescheduled due to the illness/absence of the clinician scheduled to make the visit. The patient has the legal right to voice grievances regarding treatment or care that he or she receives (or fails to receive) and/or for lack of respect for property . Agencies must advise patients of these rights in writing and provide the patient with the phone number for the home health reporting hotline in that particular state, its hours of operation and purpose. It is important to document all steps taken toward resolution of a complaint, even if the complaint cannot be resolved. “Even if the complaint or grievance was not possible to solve, surveyors will want to see documentation showing the actions that were attempted to resolve it — and the outcomes,” J’non says. Who in your agency is accountable for receiving, documenting and resolving complaints? What is the time frame for documenting/reporting a complaint? What is the time frame for investigating the complaint? Does your agency have an intake form for standardizing the information-gathering aspect of documentation? Does your agency have a standardized means of documenting attempts to resolve the complaint? How are your employees made aware of your agency’s procedures for handling complaints? How often are your agency’s procedures reviewed, updated and re-shared with employees? How does your agency handle any variation from its own written procedures when reporting or investigating a complaint? Are sanctions outlined and enforced? If you’d like to read more about the specific items which will be evaluated at your agency during Survey, “Survey Ahead” is now available on Amazon. Click here to take a look. The hottest topics in home health, best practices, useful tips and more are yours FREE each month when you subscribe to our e-newsletters. 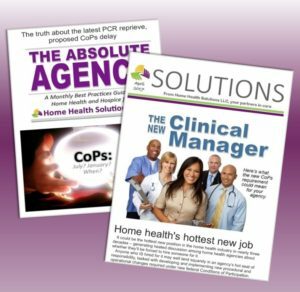 SOLUTIONS showcases industry news along with products designed to help you with clinical and operational success. The ABSOLUTE AGENCY tackles topics of interest to agency management. THE MONDAY FIX is our weekly e-newsletter featuring coding and OASIS tips. 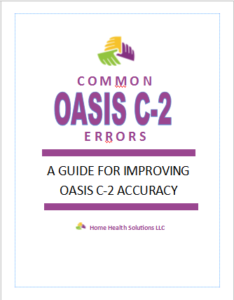 Our Guide to C-2 Accuracy (priced at just $59) is a great resource for your agency – especially with functional items playing such an integral role in the new HHGM. Visit our online store to see all our helpful CoPs products! Browse THE SOLUTIONS SHOP by clicking here. Looking for our online store?